Born in 1924 in the small farming town of Plains, Georgia, Mr. Jimmy Carter grew up in a modest family where, in addition to working his own farm, continued a small business of his father's, selling fertilizers and farm supplies. Carter received a Bachelor of Science degree from the United States Naval Academy in 1946. He later did graduate work in nuclear physics at Union College. During his naval career, he lived in many parts of the United States and served around the world, including the Far East. In 1971, Carter became Georgia›s 76th governor then moved on to become, in 1973, the Democratic National Committee campaign chairman for the 1974 congressional elections. He announced his candidacy for the Democratic presidential nomination on December 12, 1974, and won his party›s nomination at the 1976 Democratic National Convention on the first ballot. He was elected President on November 2, 1976. Jimmy Carter served as President from January 20, 1977, to January 20, 1981, where he championed human rights throughout the world. 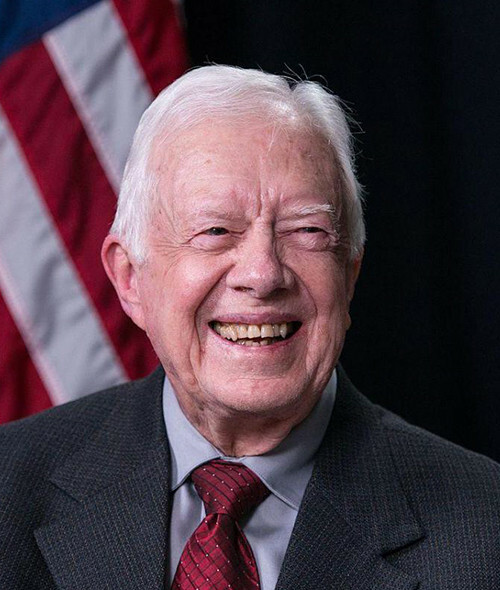 After leaving office, Carter and his wife Rosalynn founded the Carter Center in 1982, a nongovernmental, not-for-profit organization that works to advance human rights. He has traveled extensively to conduct peace negotiations, observe elections, and advance disease prevention and eradication in developing nations. Carter is a key figure in the Habitat for Humanity project, and also remains particularly vocal on the Israeli–Palestinian conflict. Carter’s diligent endeavors during his presidency for establishing peace in the Middle East were well-acknowledged and established. Following his term in the White House, he is now more active through the Carter Foundation to further democracy and better living conditions for many countries in the world, including Arab countries, through this Foundation’s contributions in monitoring National Elections and encourage peaceful and democratic transfers in these countries. He has been a prolific author in his post-presidency, writing 21 of his 27 books that cover a variety of topics, including humanitarian work, aging, religion, human rights, and poetry. In addition to many awards and honors, President Carter received the Nobel Peace Prize in 2002 for his work «to find peaceful solutions to international conflicts, to advance democracy and human rights, and to promote economic and social development» through The Carter Center. Carter is unique in receiving the award for his actions after leaving the presidency.